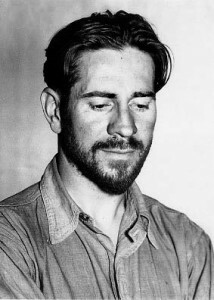 Ed Ricketts, the real-life marine biologist immortalised as Doc in Steinbeck’s Cannery Row, evolved a theory of how everything is connected in the natural world. He observed that the sea creatures he studied were influenced in their form and life by the whole of their environment, which could be by as distant an object as the moon (tides, light etc.) or as minimal as tiny variations in water temperature or salinity. Later he progressed this into a philosophy of ‘non-teleological thinking’, a way of viewing things as they are, rather than seeking narrow anthropocentric (look it up, I had to – Ed) explanations for them. And what, in the name of all things two-wheeled, loud and leathery has any of this got to do with biking, I hear you ask!? Well it started off simply enough; on a visit to Roadrunners in Stroud (my local bike shop) I noticed a couple of neat little custom bikes in the workshop and got to chatting with Andy, Lawrence and Henry about them. I thought I’d do a short piece on how and why they built the bikes and a little bit about them as people. But as our conversations progressed I started to realise that, like Ed Ricketts’ sea creatures, these bikes are inseparable from the totality of our biking culture and even the global recession. They are what they are because of influences way beyond a little workshop in Gloucestershire. 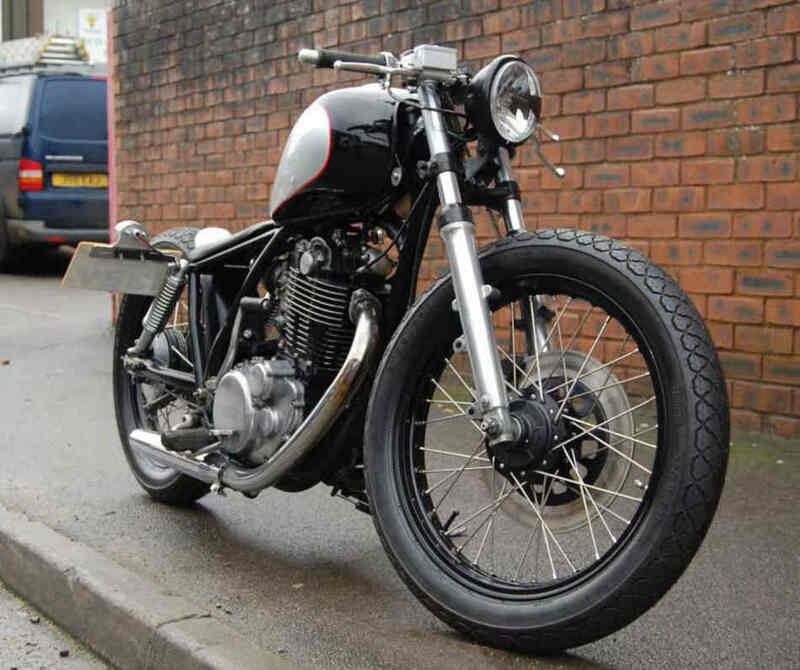 The bikes themselves are based on the 1978 Yamaha SR500, a simple and now pretty ancient air-cooled, single-cylinder road bike. The key characteristics, even when it first came out twenty-five years ago, were simplicity and a retro look and feel, with a good dollop of Japanese reliability thrown in. And that is where it all starts to get interesting. Why would three ordinary guys in a relatively modest bike shop be building bikes like this? First and foremost it’s because they can! How refreshing to meet three young men (well, they’re young to me!) with skill, imagination and ambition. “We build them in our down time when the workshop isn’t busy,” says Andy, hard at work on a punter’s bike. 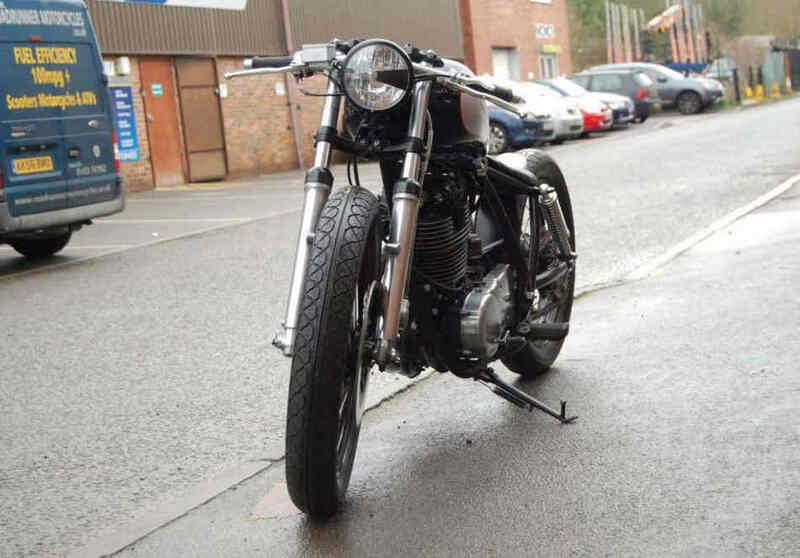 He is responsible for the custom with high-rise handlebars, which he bought for £400 as a frame and wheels, with the engine and other parts “tipped into a box”. The frame was cut down at the back and the shocks reduced from 320 to 295mm. The wheels were painted and rebuilt with stainless spokes and the forks got a good polishing. The engine was painted and then the edges taken back to reveal the alloy fins and to round off the corners. One job that was sent out to a specialist was shortening the front forks by three inches. 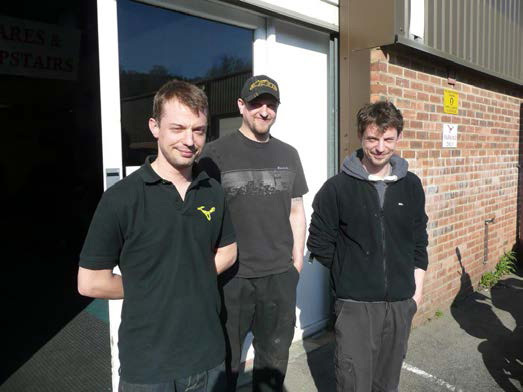 “We didn’t want to risk making a mistake rethreading the tubes at the top,” says Henry, “because there isn’t enough metal to do it again if it goes wrong.” Fortunately there is a network of local expertise they can rely on for advice and specialist skills. The finish on the bike all points to eliminating unnecessary details and tidying everything up until what is left is a motorcycle in its simplest form. It harks back to a bygone age but is paradoxically very much a product of modern times. It reflects a new desire amongst bikers for something uncomplicated but stylish and reliable. Something to be ridden and enjoyed in a way that is very hard to do on a screaming crotch-rocket with computerised gizmos everywhere you look. Not because you can’t ride like that but because you don’t always want to and it feels a bit silly to be bimbling along a country lane soaking up the sunset on a Ducati 1199 Panigale. On a bike like this you can relax and look cool at the same time, and no-one expects you to get your knee down at every roundabout. These bikes are a rejection of excess. 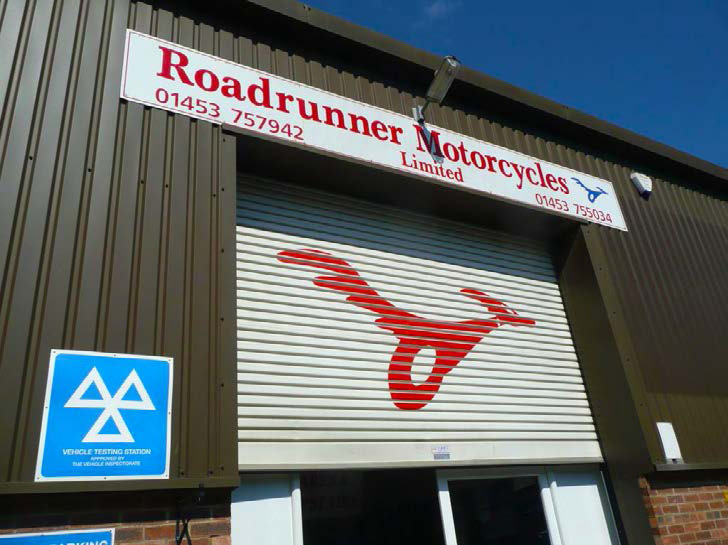 However, the mainstay of Roadrunner’s business is and always will be the shop, servicing and fixing people’s bikes. Customer care is something that comes naturally to them. “We like to make sure people are safe when they ride out of here,” continues Lawrence, “we wouldn’t sleep at night if we thought people could get hurt from us not doing a good job.” Again this is an old fashioned attitude in a modern world. They want to expand into bigger premises and offer more bikes and space for bikers to come and hang out, but that’s dependent on finding the right kind of place in a more prominent location. So how does this all connect to the financial climate and the ebb and flow of biking culture as it washes over all of us? Well, I can’t help wondering if the recession we’re in is going to mark a bigger turning point in our motorcycling lives than we thought. For the last three decades our world has been on an upward spiral of ever increasing excess and sophistication. Like everything, biking became ever more glossy, image focussed, high value, leisure driven and technologically complicated. But I can’t help wondering if it didn’t leave a majority of us behind, yearning for something less intense. Then the crash came and changed everything anyway. Some big names like George White went to the wall, companies like Hein Gericke shrunk from 49 to 16 stores, while sales of superfast mega-toy machines have declined drastically. But surely this is a good thing because did we honestly ever enjoy the big dealerships and all that ‘have a nice day’ corporate falseness? The discounts were never that great and I never really felt more than just a ‘punter’ who needed to be separated from his money. Now there’s a noticeable change in the air, which is manifested in a resurgence in commuting by powered two-wheelers. A lot of ‘weekend warriors’ are selling their machines and the fact that fatalities are down by 10% must mean that we’re either running out of morons or we’re changing the way we ride. And the latter seems far more likely given the continuing strength of cruiser, scooter, adventure and ‘retro’ bike sales. Austerity has a way of focussing our minds on what is important to us, what is necessary and what is not. It has a way of weeding out the merely ambitious from the hard working and allows us to separate the things that only look good from the things that actually are good. The recession has blown away the froth from biking and left the best part, the part that always endures through thick and thin. We are surely undergoing a major reassessment of our values. 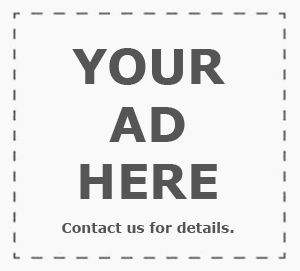 Instead of just throwing money at our desires we are looking for people who can make things again. Individuality is still in but reliability and service are also highly valued. Is the warm beating heart of biking re-emerging after a long time waiting in the shadows of corporate capitalism? Who can say for sure but I can’t help feeling that these two custom bobbers and this little shop in Stroud are a bellwether for our biking future, a simpler and more honest future. It’s such a joy to find people who are surviving and thriving in the downturn. The kind of people you can get to know and who will get to know you. 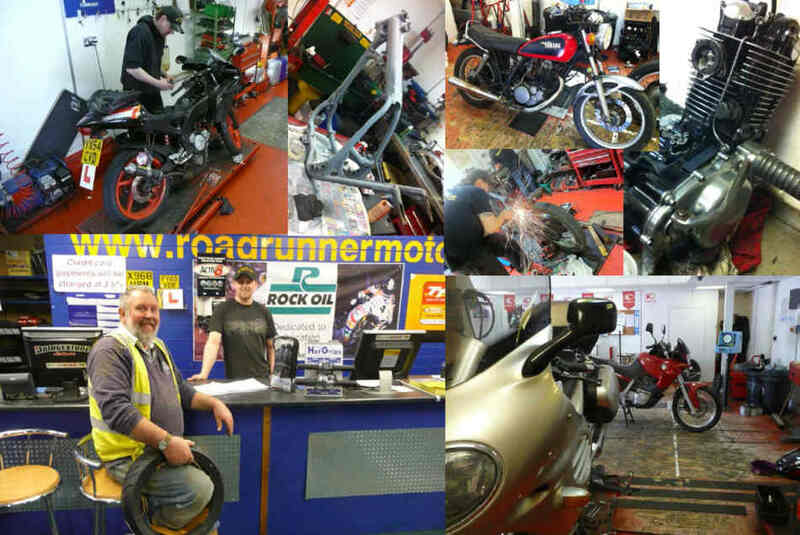 Who will give you any amount of good advice and go the extra mile to fix your bike, to keep you safe and happy. 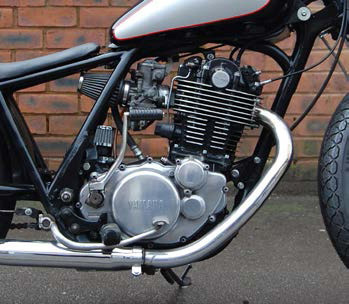 Amazingly, they’ll also build you a one-off ‘special’ that could make even the richest motorcyclist envious. As always, one of my favorite living writers. Oldlongdog, keep at it.